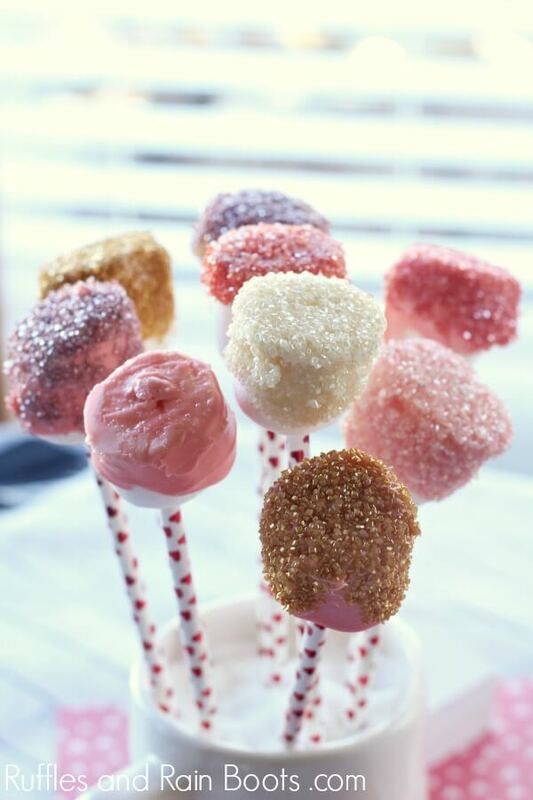 These dipped marshmallow pops make an amazing treat for a warm cup of cocoa or fitted into a bouquet for gifting. They’re fun and easy, so let’s get started. Easy treats and gifts are a staple here at Ruffles and Rain Boots. If it’s fun, pretty, and functional, count me in for the crafty fun. 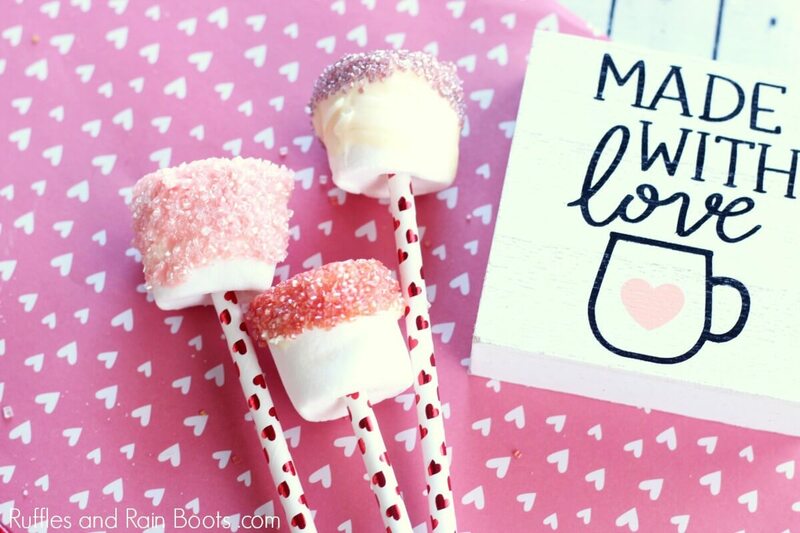 This week, we’re sharing these adorable dipped marshmallow pops for Valentine’s Day. Aren’t they just the cutest? 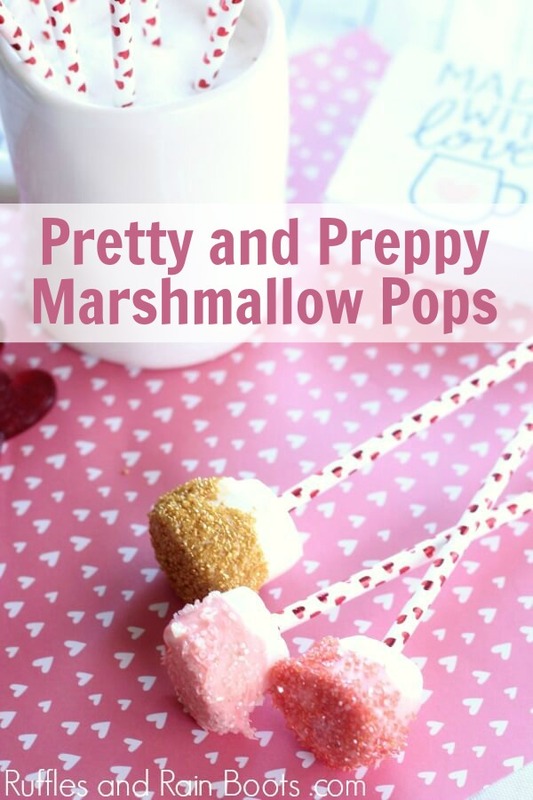 These sweeties remind me of Mean Girls – “On Wednesdays, we wear pink.” – and I can’t help but call them pretty and pretty marshmallows. 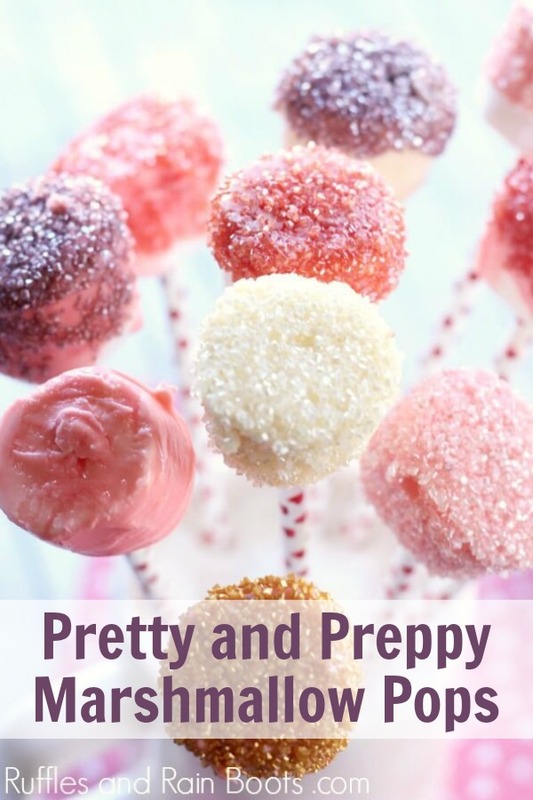 There are a few tips and tricks I want to share when making these marshmallow pops, especially if you’re going to form them into a marshmallow bouquet. Get the kids in the kitchen to help. The candy bark allows the marshmallows to slide pretty easily and you can be ready with a spoon to smooth out any big clumps. Make an assembly line as mentioned in the video. 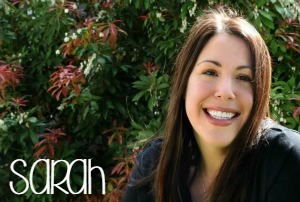 This makes it so much easier to work quickly and without making a big mess. Vary the colors by adding food coloring to the melted candy bark – we used a touch of pink on some of ours and they really make the pink sparkles pop! In addition to the few ingredients mentioned below, here are a few supplies you’ll need to make these fun dipped marshmallow pops. 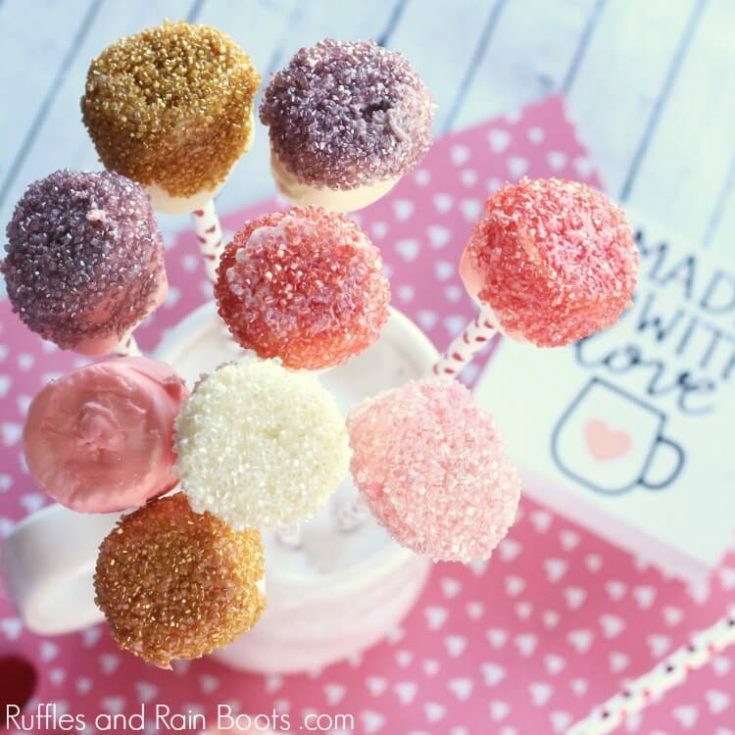 These adorable dipped marshmallow pops make a great gift for Valentine's Day or just to enjoy with hot cocoa on a cold day. Press straws nearly all the way into the marshmallows. Set aside. Melt almond bark in a small glass dish per package instructions. 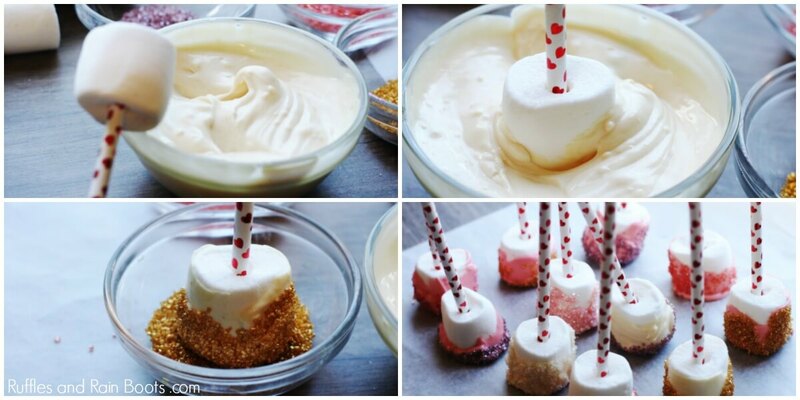 Dip the marshmallow into the melted candy and roll to coat. Use the back of a spoon to help smooth out and remove excess chocolate. Next, dip the coated marshmallow immediately into a sprinkle bowl, rolling to coat. Place the coated and dipped marshmallow pops on the parchment paper to set. Optional: color the candy coating with food coloring to match the sprinkles for a real color pop! Create an assembly line, of sorts, before you start. Make a space for your melted candy bark. Then, place your sprinkles in small bowls grouped together. Finally, lay out a piece of parchment paper for the marshmallow pops to set and harden.